For other uses, see Memory (disambiguation). Roger W. Sperry • H. M. • K. C.
Sensory memory corresponds approximately to the initial 200 - 500 milliseconds after an item is perceived. The ability to look at an item, and remember what it looked like with just a second of observation, or memorization, is an example of sensory memory. With very short presentations, participants often report that they seem to "see" more than they can actually report. The first experiments exploring this form of sensory memory were conducted by George Sperling (1960) using the "partial report paradigm." Subjects were presented with a grid of 12 letters, arranged into three rows of 4. After a brief presentation, subjects were then played either a high, medium or low tone, cuing them which of the rows to report. Based on these partial report experiments, Sperling was able to show that the capacity of sensory memory was approximately 12 items, but that it degraded very quickly (within a few hundred milliseconds). Because this form of memory degrades so quickly, participants would see the display, but be unable to report all of the items (12 in the "whole report" procedure) before they decayed. This type of memory cannot be prolonged via rehearsal. people can remember a great deal more letters. This is because they are able to chunk the information into meaningful groups of letters. Beyond finding meaning in the abbreviations above, Herbert Simon showed that the ideal size for chunking letters and numbers, meaningful or not, was three. This may be reflected in some countries in the tendency to remember phone numbers as several chunks of three numbers with the final four-number groups generally broken down into two groups of two. The storage in sensory memory and short-term memory generally have a strictly limited capacity and duration, which means that information is available for a certain period of time, but is not retained indefinitely. By contrast, long-term memory can store much larger quantities of information for potentially unlimited duration (sometimes a whole life span). The capacity can also approach infinity (unlimited). For example, given a random seven-digit number, we may remember it for only a few seconds before forgetting, suggesting it was stored in our short-term memory. On the other hand, we can remember telephone numbers for many years through repetition; this information is said to be stored in long-term memory. While short-term memory encodes information acoustically, long-term memory encodes it semantically: Baddeley (1966) discovered that after 20 minutes, test subjects had the least difficulty recalling a collection of words that had similar meanings (e.g. big, large, great, huge). Short-term memory is supported by transient patterns of neuronal communication, dependent on regions of the frontal lobe (especially dorsolateral prefrontal cortex) and the parietal lobe. Long-term memories, on the other hand, are maintained by more stable and permanent changes in neural connections widely spread throughout the brain. The hippocampus is essential (for learning new information) to the consolidation of information from short-term to long-term memory, although it does not seem to store information itself. Without the hippocampus, new memories are unable to be stored into long-term memory, and there will be a very short attention span. Furthermore, it may be involved in changing neural connections for a period of three months or more after the initial learning. One of the primary functions of sleep is improving consolidation of information, as it can be shown that memory depends on getting sufficient sleep between training and test, and that the hippocampus replays activity from the current day while sleeping. Models of memory provide abstract representations of how memory is believed to work. Below are several models proposed over the years by various psychologists. Note that there is some controversy as to whether there are several memory structures, for example, Tarnow (2005) finds that it is likely that there is only one memory structure between 6 and 600 seconds. The multi-store model (also known as Atkinson-Shiffrin memory model) was first recognised in 1968 by Atkinson and Shiffrin. The multi-store model has been criticized for being too simplistic. For instance, long-term memory is believed to be actually made up of multiple subcomponents, such as episodic and procedural memory. It also proposes that rehearsal is the only mechanism by which information eventually reaches long-term storage, but evidence shows us capable of remembering things without rehearsal. The model also shows all the memory stores as being a single unit whereas research into this shows different. For example, short-term memory can be broken up into different units such as visual information and acoustic information. Patient KF proves this. Patient KF was brain damaged and had problems with his short term memory. He had problems with things such as spoken numbers, letters and words and with significant sounds (such as doorbells and cats meowing). Other parts of STM were unaffected, such as visual (pictures). It also shows the sensory store as a single unit whilst we know that the sensory store is split up into several different parts such as taste, vision, and hearing. In 1974 Baddeley and Hitch proposed a working memory model which replaced the concept of general short term memory with specific, active components. 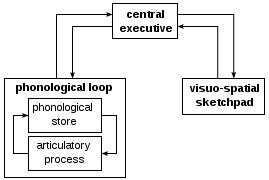 In this model, working memory consists of three basic stores: the central executive, the phonological loop and the visuo-spatial sketchpad. In 2000 this model was expanded with the multimodal episodic buffer. The central executive essentially acts as attention. It channels information to the three component processes: the phonological loop, the visuo-spatial sketchpad, and the episodic buffer. The phonological loop stores auditory information by silently rehearsing sounds or words in a continuous loop: the articulatory process (for example the repetition of a phone number over and over again). Then, a short list of data is easier to remember. The visuo-spatial sketchpad stores visual and spatial information. It is engaged when performing spatial tasks (such as judging distances) or visual ones (such as counting the windows on a house or imagining images). The working memory model explains many practical observations, such as why it is easier to do two different tasks (one verbal and one visual) than two similar tasks (e.g., two visual), and the aforementioned word-length effect. However, the concept of a central executive as noted here has been criticized as inadequate and vague. Organization - Mandler (1967) gave participants a pack of word cards and asked them to sort them into any number of piles using any system of categorization they liked. When they were later asked to recall as many of the words as they could, those who used more categories remembered more words. This study suggested that the act of organizing information makes it more memorable. Distinctiveness - Eysenck and Eysenck (1980) asked participants to say words in a distinctive way, e.g. spell the words out loud. Such participants recalled the words better than those who simply read them off a list. Effort - Tyler et al. (1979) had participants solve a series of anagrams, some easy (FAHTER) and some difficult (HREFAT). The participants recalled the difficult anagrams better, presumably because they put more effort into them. Elaboration - Palmere et al. (1983) gave participants descriptive paragraphs of a fictitious African nation. There were some short paragraphs and some with extra sentences elaborating the main idea. Recall was higher for the ideas in the elaborated paragraphs. In contrast, procedural memory (or implicit memory) is not based on the conscious recall of information, but on implicit learning. Procedural memory is primarily employed in learning motor skills and should be considered a subset of implicit memory. It is revealed when one does better in a given task due only to repetition - no new explicit memories have been formed, but one is unconsciously accessing aspects of those previous experiences. Procedural memory involved in motor learning depends on the cerebellum and basal ganglia. A further major way to distinguish different memory functions is whether the content to be remembered is in the past, retrospective memory, or whether the content is to be remembered in the future, prospective memory. Thus, retrospective memory as a category includes semantic memory and episodic/autobiographical memory. In contrast, prospective memory is memory for future intentions, or remembering to remember (Winograd, 1988). Prospective memory can be further broken down into event- and time-based prospective remembering. Time-based prospective memories are triggered by a time-cue, such as going to the doctor (action) at 4pm (cue). Event-based prospective memories are intentions triggered by cues, such as remembering to post a letter (action) after seeing a mailbox (cue). Cues do not need to be related to the action (as the mailbox example is), and lists, sticky-notes, knotted handkerchiefs, or string around the finger are all examples of cues that are produced by people as a strategy to enhance prospective memory. Overall, the physiological mechanisms behind memory are poorly understood. Brain areas such as the hippocampus, the amygdala, the striatum, or the mammillary bodies are thought to be involved in specific types of memory. For example, the hippocampus is believed to be involved in spatial learning and declarative learning, while the amygdala is thought to be involved in emotional memory. Damage to certain areas in patients and animal models and subsequent memory deficits is a primary source of information. However, rather than implicating a specific area, it could be that damage to adjacent areas, or to a pathway traveling through the area is actually responsible for the observed deficit. Further, it is not sufficient to describe memory, and its counterpart, learning, as solely dependent on specific brain regions. Learning and memory are attributed to changes in neuronal synapses, thought to be mediated by long-term potentiation and long-term depression. Hebb distinguished between short-term and long-term memory. He postulated that any memory that stayed in short-term storage for a long enough time would be consolidated into a long-term memory. Later research showed this to be false. Research has shown that direct injections of cortisol or epinephrine help the storage of recent experiences. This is also true for stimulation of the amygdala. This proves that excitement enhances memory by the stimulation of hormones that affect the amygdala. Excessive or prolonged stress (with prolonged cortisol) may hurt memory storage. Patients with amygdalar damage are no more likely to remember emotionally charged words than nonemotionally charged ones. The hippocampus is important for explicit memory. The hippocampus is also important for memory consolidation. The hippocampus receives input from different parts of the cortex and sends its output out to different parts of the brain also. The input comes from secondary and tertiary sensory areas that have processed the information a lot already. Hippocampal damage may also cause memory loss and problems with memory storage. Much of the current knowledge of memory has come from studying memory disorders. Loss of memory is known as amnesia. There are many sorts of amnesia, and by studying their different forms, it has become possible to observe apparent defects in individual sub-systems of the brain's memory systems, and thus hypothesize their function in the normally working brain. Other neurological disorders such as Alzheimer's disease can also affect memory and cognition. Hyperthymesia, or hyperthymesic syndrome, is a disorder which affects an individual's autobiographical memory, essentially meaning that they cannot forget small details that otherwise would not be stored. Korsakoff's syndrome, also known as Korsakoff's psychosis, amnesic-confabulatory syndrome, is an organic brain disease that adversely affects memory. While not a disorder, a common temporary failure of word retrieval from memory is the tip-of-the-tongue phenomenon. Sufferers of Nominal Aphasia (also called Anomia), however, do experience the tip-of-the-tongue phenomenon on an ongoing basis due to damage to the frontal and parietal lobes of the brain. Memorization is a method of learning that allows an individual to recall information verbatim. Rote learning is the method most often used. Methods of memorizing things have been the subject of much discussion over the years with some writers, such as Cosmos Rossellius using visual alphabets. The spacing effect shows that an individual is more likely to remember a list of items when rehearsal is spaced over an extended period of time. In contrast to this is cramming which is intensive memorization in a short period of time. Also relevant is the Zeigarnik effect which states that people remember uncompleted or interrupted tasks better than completed ones. In March 2007 German researchers found they could use odors to re-activate new memories in the brains of people while they slept and the volunteers remembered better later. At the Center for Cognitive Science at Ohio State University, researchers have found that memory accuracy of adults is hurt by the fact that they know more than children and tend to apply this knowledge when learning new information. The findings appeared in the August 2004 edition of the journal Psychological Science. It's inconclusive that memory may be improved via simple lifestyle changes such as undertaking memory exercises, eating healthily, engaging in moderate physical activity, and reducing stress. The International Longevity Center released in 2001 a report which includes in pages 14-16 recommendations for keeping the mind in good functionality until advanced age. Some of the recommendations are to stay intellectually active through learning, training or reading, to keep physically active so to promote blood circulation to the brain, to socialize, to reduce stress, to keep sleep time regular, to avoid depression or emotional instability and to observe good nutrition. Paired associate learning - when one learns to associate one specific word with another. For example when given a word such as "safe" one must learn to say another specific word, such as "green". This is stimulus and response. Free recall- during this task a subject would be asked to study a list of words and then sometime later they will be asked to recall or write down as many words that they can remember. Recognition- subjects are asked to remember a list of words or pictures, after which point they are asked to identify the previously presented words or pictures from among a list of alternatives that were not presented in the original list. ^ Conrad, R. (1964). Acoustic Confusions in Immediate Memory. British Journal of Psychology, 55, 75-84. ^ Baddeley, A. D. (1966). The influence of acoustic and semantic similarity on long-term memory for word sequences. Quart. J. exp. Psychol., 18, 302-9. ^ Baddeley, A.D. (2000). The episodic buffer: a new component of working memory? Trends in Cognitive Science, 4, 417-23. ^ Anderson, J.R. (1976). Language, Memory and Thought. Mahwah, NJ: Erlbaum. ^ Some progress is being made: "Scientists identify machinery that helps make memories". http://www.dukehealth.org/HealthLibrary/News/scientists_identify_machinery_that_helps_make_memories. Retrieved on 2008-11-02. ^ Kalat, J. W. (2001). Biological psychology (7th ed.). Belmont, CA: Wadsworth Publishing. ^ Smell of Roses May Improve Memory. Reuters, March 12, 2007. ^ "International Longevity Center report on memory" (PDF). http://www.ilcusa.org/_lib/pdf/isoa.pdf. Retrieved on 1 September. Julia Russell; Cardwell, Mike; Flanagan, Cara (2005). Angels on Psychology: Companion Volume. Cheltenham, U.K: Nelson Thornes. ISBN 0-7487-9463-8. Costa-Mattioli, M; et al. (2007). "eIF2α Phosphorylation Bidirectionally Regulates the Switch from Short- to Long-Term Synaptic Plasticity and Memory". Cell 129: 195–206. doi:10.1016/j.cell.2007.01.050. PMID 17418795. http://www.cell.com/content/article/abstract?uid=PIIS0092867407003248. This page was last modified on 6 April 2009, at 17:07.